The first of three traviatas scheduled for this leg of Man in Chair’s 2012 travels, this lush, traditional staging by Director Richard Eyre and his Designer Bob Crowley, never fails to delight. Actually, it could have been four traviatas, had the incomparable Anna Netrebko not cancelled appearances the week before due to poorly timed, but surely necessary, foot surgery. ROH kindly allows tickets to be re-sold so advantage was taken of this service given that advance notice was available this time around. 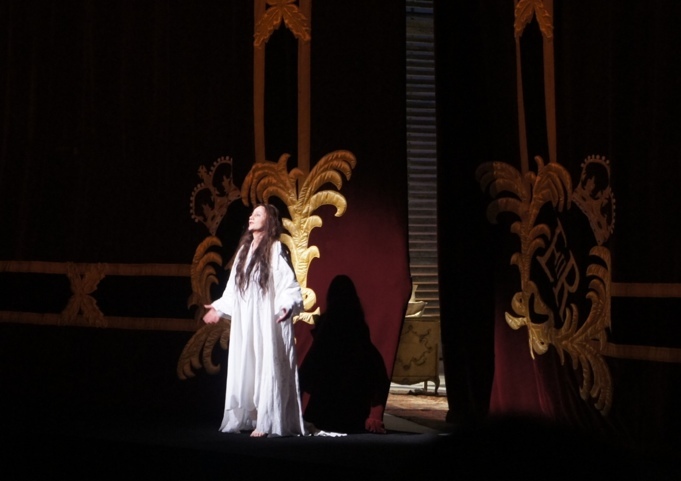 Four years ago, patrons were advised at the door of Ms Netrebko’s indisposition, at which Ermonela Jaho made her Royal Opera debut at very short notice. On that night, having Jonas Kaufmann and Dimitri Hvorovstovsky as the Germonts ensured there was still plenty of incredible talent on display, and Jaho won the house over with an altogether auspicious debut. With a nod to Groundhog Day, this time around patrons were advised that it was Ms Jaho who was indisposed, paving the way for the House debut of another European soprano, Bernarda Bobro. Ms Bobro (above) made an incredibly confident debut, clearly highly experienced in the seminal role of Violetta. She maneuvered the massive hoop skirts and crowded stage with ease, and was the very picture of the ideal casting for Violetta. Bobro’s voice covered the range of styles required for a sterling traviata: expressive in snatches of coloratura, commanding in mid range, strong even in pianissimo. Bobro easily filled the House with her voice, having the awareness, even under the inherent pressure of the situation, to adjust her sound to suit the orchestra at times. Best of all, her voice blended beautifully with her two male co-stars, and her acting with them was just as great. It was as if they had been rehearsing together for weeks. Such a passionate “Un di felice” kiss between Violetta and Alfredo cannot be recalled. Rotating Violettas aside, principal attraction of the evening was the new Italian superstar tenor Vittorio Grigolo, and to say he did not disappoint would be a huge understatement. Tall, broad-shouldered and supremely handsome, like a kind of Hollywood version of an AFL footballer, Grigolo’s voice has a truly thrilling ring that could fill a stadium. His offstage singing during “Sempre libera” was louder than most would be able to achieve onstage. Grigolo absolutely brought the house down at the beginning act two with “La lunga lei/De meiei bollenti spiriti”, caressing the final a capella phrases like a loving poet. 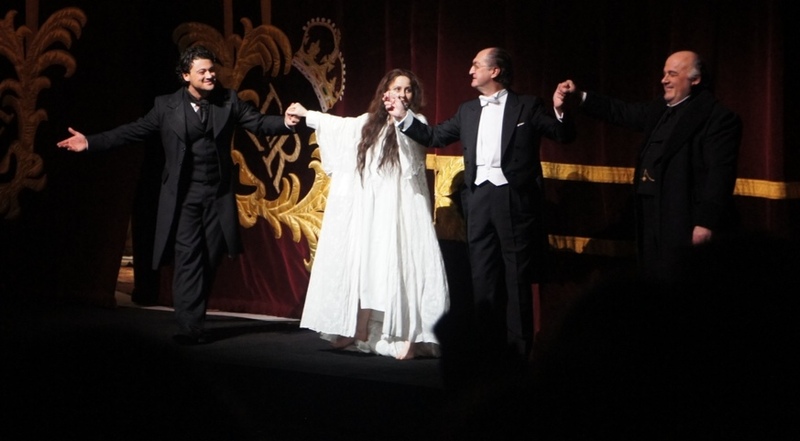 The final high note of “Oh mio rimorso” was clearly there but its impact was somewhat lessened due to Alfredo’s exit. Also a strong actor, Grigolo easily captured the impetuous, passionate nature of Alfredo, his quick anger at Violetta’s disappearance making Alfredo’s public humiliation of her completely believable. They don’t build basses like Paolo Gavanelli any more, his solid build not only supporting his effortlessly powerful voice but also adding to his threatening presence as Giorgio Germont. 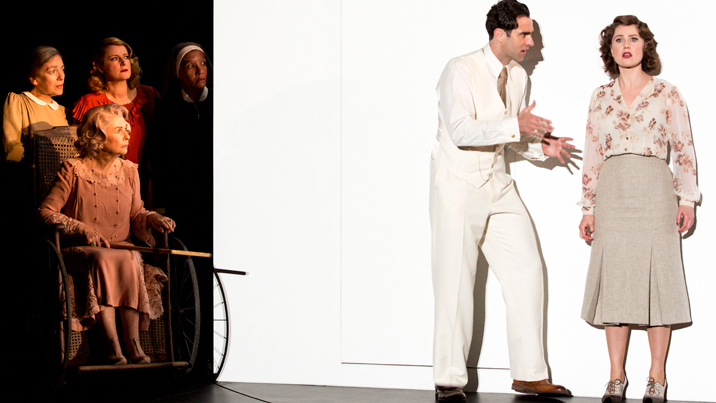 Gavanelli’s interaction with Bobro during “Dite alla giovine” was intimate and affecting, successfully setting up Giorgio’s shame over his son at the end of act two and his deep remorse over the tragedy of act three. A disappointing element of the performance was the chorus: their singing was lackluster and their acting was worse. This production is sure to be staged again at ROH again in the near future, the only surprise might be who will next be discovered as Violetta. A packed house enjoyed the final performance in this successful encore season. 2010 seems to have been a big year for Tosca. 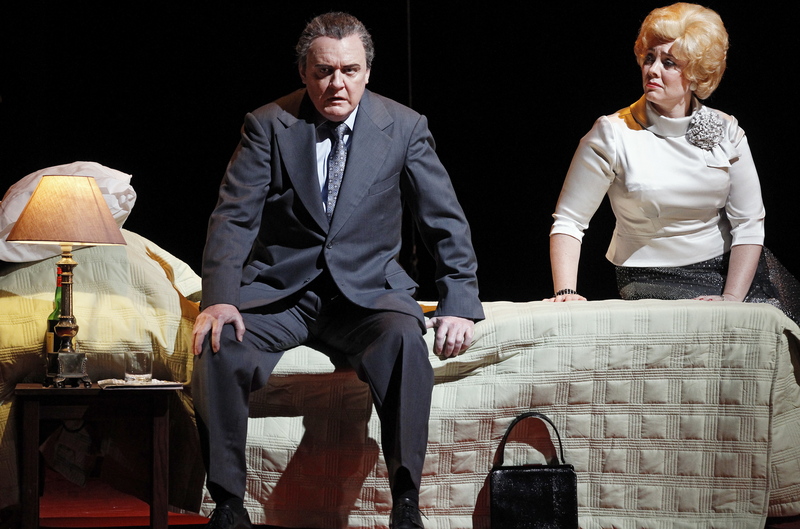 Having finally caught up with this grand, if surprisingly traditional, production it is clear that ENO’s staging was streets ahead ahead of the maligned efforts of Opera Australia and the Metropolitan Opera in that year. Frank Phillip Schlossmann’s set designs are on a massive scale, easily matching the power of the magnificent score. A through line of gilded excess looks lavish, particularly in Scarpia’s majestic headquarters. 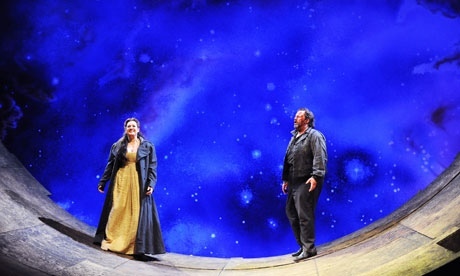 A circular motif builds to a huge semi circular stage, resembling a skate ramp, in act three, with a swirling galaxy the literal backdrop for “And The Stars Shone”. Director Catherine Malfitano keeps the intimate drama ablaze, with the thrilling nature of the opera fully realised. Conductor Stephen Lord adds to the excitement, leading a dynamic performance of the movie soundtrack-like score from the massive Coliseum orchestra pit. Sung, as in the ENO way, in English, the clarity of the diction made the subtitles superfluous. The English translation, however, does no favours to the beauty and poetry of the score. 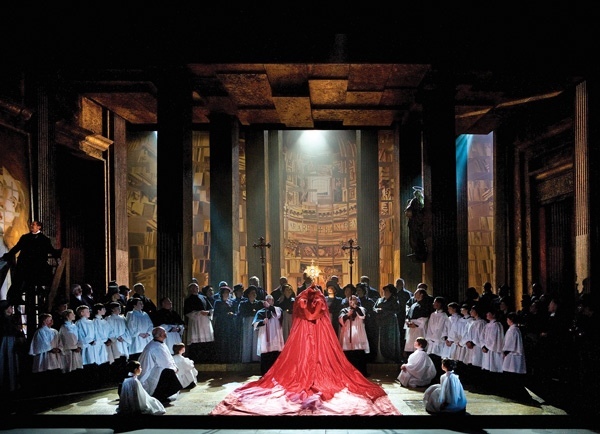 Claire Rutter shines as Tosca, capturing both the diva and victim elements of the role and singing magnificently. “I Lived for Art” was exquisite, a suitably solemn moment amidst the relentless action. Gwyn Hugh Jones was in excellent voice as Cavaradossi, his jolly likability adding significantly to the tragedy. Anthony Michaels-Moore was a powerful, commanding Scarpia, his maleficence palpable across the footlights. 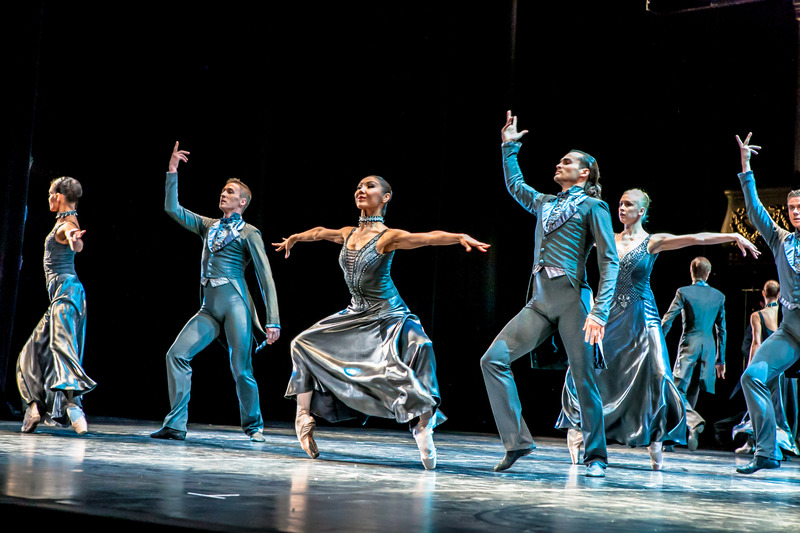 Attendance has been high during this second leg of this return season thanks to Antonio Pappano’s fascinating documentary, which aired on Christmas Eve ahead of a screening of the star-studded Royal Opera House production. Fortunate timing aside, the quality of this production stands on its own considerable merits.